In some physical systems, even elements quite distant from one another are able to synchronize their actions. At a first glance, the phenomenon looks rather mysterious. Using a network of simple electronic oscillators interconnected as a ring, researchers from the Institute of Nuclear Physics of the Polish Academy of Sciences in Cracow have shown that, in fact, remote synchronization can, at least in certain cases, be explained quite clearly. The most fascinating physical, chemical and biological processes are probably those in which "something" comes from "nothing". For example, why do concentric rings suddenly appear in a seemingly homogeneous layer of liquid, as in the case of the Belousov-Zhabotinsky reaction? Why can a hydra have many tentacles, always arranged so regularly? Why in a network of a dozen or so simple electronic oscillators connected in a ring, do some remote elements suddenly start to operate in the same rhythm? At the root of similar phenomena across such different systems there are universal, though still poorly understood, mechanisms of synchronizing the activity of a system's components. The nuances of one of these mechanisms have just been explained by scientists from the Institute of Nuclear Physics of the Polish Academy of Sciences (IFJ PAN) in Cracow, in close collaboration with colleagues from the University of Palermo and the University of Catania in Italy. Synchronization leading to the birth of shape (representing a form of morphogenesis) can occur in systems of diverse nature, and various mechanisms may be responsible for its occurrence. A metaphor of a representative situation is that in a fairly uniform group of guests who do not know one another at a large party, clearly visible groups of similar interests form quickly, within which the people spend most of the time talking to each other. This type of phenomenon - the result of specific features of certain elements or arising from accidental events - is referred to as cluster synchronization. It is present in many physical systems, for example between neurons in the human brain. "In our latest research, we have been dealing with an instance of a related type of synchronization: remote synchronization. This is when elements or groups of elements that are not directly connected with each other synchronize their activity, but do so without entraining the other elements through which the synchronization information is propagated. It resembles a situation where two people exchange information with each other through a courier, but the courier not only cannot read the contents of the messages, but is often quite oblivious to the existence of a hidden message," explains Dr. Ludovico Minati (IFJ PAN), the main author of the publication in the well-known scientific journal Chaos. Various occurrences of remote synchronization have been described to date, and remote synchronization is deemed to occur for instance between areas of the brain distant from one another, between meteorological phenomena over different continents, and even between elements of electronic circuits. 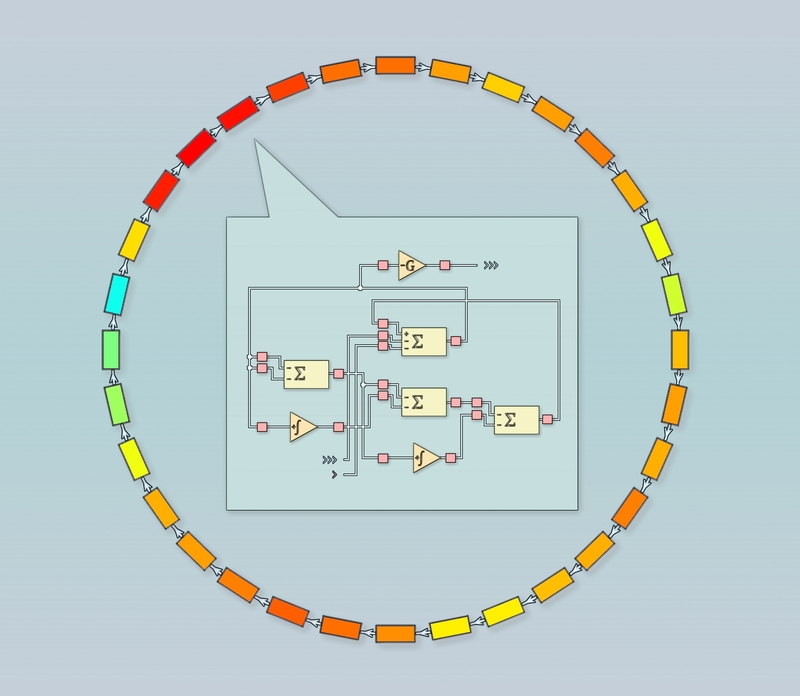 In 2015, Dr. Minati, then at the University of Trento, described an instance of this sort of synchronization in networks built out of just a dozen or so simple electronic oscillators connected in series as a ring. It was noticed then that individual oscillators tried to synchronize not only with their closest neighbors on the ring, but also with some more distant ones, at the same time remaining less desynchronized with the others located at an intermediate distance. "We observed this effect with real fascination because it occurred in a device much smaller, but above all, radically simpler than the brain. The phenomenon was described in detail, unfortunately we were not able to fully understand its nature. We have only presented a satisfactory explanation in our latest publication," says Dr. Minati. Researchers from the IFJ PAN studied rings of oscillators experimentally and with the use of computer simulations. The observation that information has to propagate in the rings using not one but three frequencies turned out to be a breakthrough (in this respect, the phenomenon resembles the amplitude modulation used in radio technology). Each oscillator not only generated its own signal of a chaotic nature, but also reacted to signals coming from nearby oscillators, and transferred them to the other two bands. Depending on their phase in a given oscillator, these signals were amplified or weakened in a manner resembling an interference effect. The researchers accordingly observed patterns reminiscent of the diffraction bands well known from optics. Fluctuations of synchronization intensity giving rise to "remoteness" appeared between oscillators wherein constructive or destructive interference occurred. In order to better understand the nature of the observed synchronization, the Cracow-based physicists subjected the oscillator rings to additional tests. The sensitivity of synchronization to high-intensity noise introduced at various sites of the systems was tested, varying numbers of oscillators in the ring were simulated together with the effects appearing on its opening. Analysis of the results made it possible to determine that in the studied oscillator rings remote synchronization is not so much a global characteristic of the whole system, as it is the result of the local interactions of individual oscillators with their surroundings. At the same time, it was also investigated whether remote synchronization could be used to transfer a signal introduced into the system from the outside. The result, however, was negative. "Understanding the mechanisms associated with the occurrence of complex interdependencies between elements in systems of diverse nature is a great challenge in non-linear science. We still have limited understanding of the mechanisms responsible for most types of remote synchronization. A more complete knowledge of similar processes would have considerable theoretical and practical significance. Who knows, maybe we would be able to better predict, for example, collective behaviours in various social networks or even financial markets?" sums up Prof. Stanislaw Drozdz (IFJ PAN, Cracow University of Technology). Those interested in conducting their own research on synchronizing electronic oscillators can download supplementary materials from the following website, including experimental time-series: ftp://ftp.aip.org/epaps/chaos/E-CHAOEH-27-012707. 1. "Apparent remote synchronization of amplitudes: A demodulation and interference effect"
2. "Remote synchronization of amplitudes across an experimental ring of non-linear oscillators"